Chewing the right answer were Soma, Sarah and Sarah. Last Sunday the television series Victoria returned to our screens in the UK (yes I know it has already been shown in the US and New Zealand!). To regular readers of Sunday Snap it probably comes as no surprise that I do like a period drama. This series introduces us to the Foreign Secretary at the time whose statue is pictured above. As with most period dramas based on real events there is an element of artistic licence. In 1848 the Foreign Secretary would have been 63 years old whereas the dashing Laurence Fox who plays him is around 23 years younger. He first became Foreign Secretary in 1830 after switching party allegiances from the Tories to the Whigs. He was brash and abrasive when dealing with other politicians both at home and abroad. The fact that Queen Victoria didn't like him was perfectly true and when he died she stated that she had never liked or respected him. He frequently clashed with Prince Albert over political policy. Prince Albert saw him as rude and disrespectful in contrast in his own very prim and proper manner. During his 20 years as Foreign Secretary he saw the fall of European monarchies during the revolutions of 1848. This put him in direct conflict with Queen Victoria and Prince Albert as he sympathised with the revolutionaries. However he was in favour of social, penal and electoral reform. He was also a passionate abolitionist and his foreign policy in the early 1830s helped to stop the slave trade in the British Empire and its colonies. After the debacle that was the Crimea War in 1854 the then Prime Minister Lord Aberdeen was forced to resign. Queen Victoria asked a number of senior politicians to form a government but they all declined for various reasons. Instead she was left with asking her nemesis to form a government. When he became Prime Minister on 4th February 1855 he was at 70 years and 109 days old the oldest person to be appointed British Prime Minister for the first time. He still holds this record. What is the name of the Foreign Secretary? We were joined last week by Susan and a Scottish snow scene. Soma has been busy with the blanket making. It's magnolia time as spotted by Sarah. The outside was brought in by Anne with a bunch of daffodils. Sarah found herself under a vast clouded sky. Out and about Kara has been looking at sculpture and storming castles. In New Zealand Betty has been visiting South Island churches. It's been a long trip for Minoru with a trip from Japan to Portugal. Finally, Jesh has has a change of heart over big skies. If you want to join in with this week's Sunday Snap then add your link to the linky below. Any theme is allowed. It doesn't have to be published today as you have until 23.55 on Friday 5th April 2019 to join in. Grab my badge below for your blog post. Just make sure it is your photo and you hold the copyright for it. I've never watched Victoria and I don't know much history, so I really don't know the answer this week! Was interesting to read that bit of history though. I wish I'd watched Victoria now! This is a tricky one this week, but I'm thinking it was Lord Palmerston? 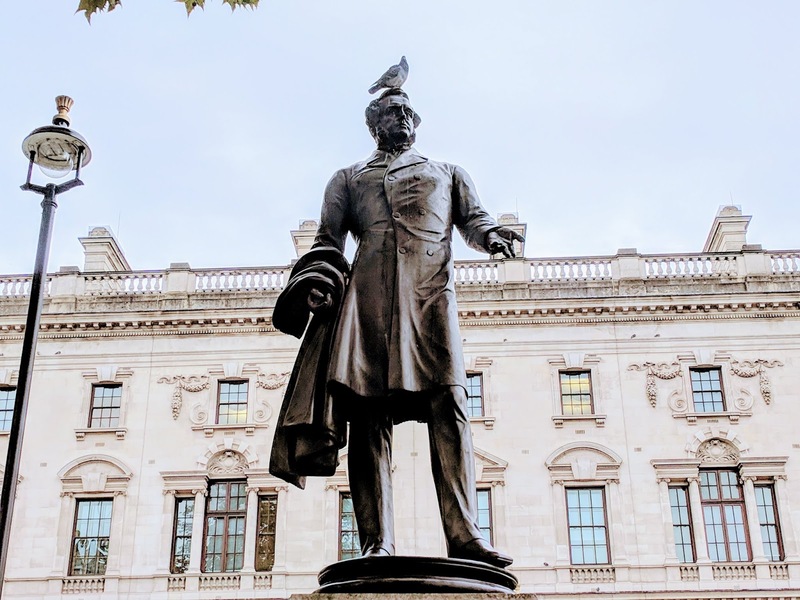 I found his statue,his name is Lord palmerston. Thanks for sharing. I think he deserves it! I had no idea and don't watch Victoria - but is he the one played by the gorgeous Lawrence Fox? (saw a trailer)' Great pigeon - he probably wouldn't have liked that much !